Our first night out of Damascus brought us into Tennessee, the 12th state of the trail. We didn’t leave town till 2 in the afternoon, but we made sure we left with full stomachs. Our first impression of the trail in Tennessee was awesome, very smooth nice hiking. The following day was a nice 22 mile ridge walk with a lot of amazing views of snow capped ridges in the distance. There wasn’t enough snow on the ground to pose a problem, but the snow bothered us later on. The shelter was too wide to hang our tarp over the opening, so the wind kept blowing snow onto everything. We cleaned the snow off all our gear and hit the trail. It was a cold and snowy morning, but it cleared up as the day went on. We could look down on Watauga Lake as we climbed down to the dam. It was a beautiful walk around the massive lake. On the way down to Laurel Fork Gorge, I slipped and busted my left knee. Nothing too serious, just a little blood and a mild limp. Laurel Fork Gorge and Falls were incredible. Probably the most spectacular falls of the trip. Just a little ways farther and we made it to Kincora Hostel nestled between the mountains. The hostel is run by Bob Peoples and his wife. He has pretty much dedicated his life to helping hikers and volunteering on the trail. 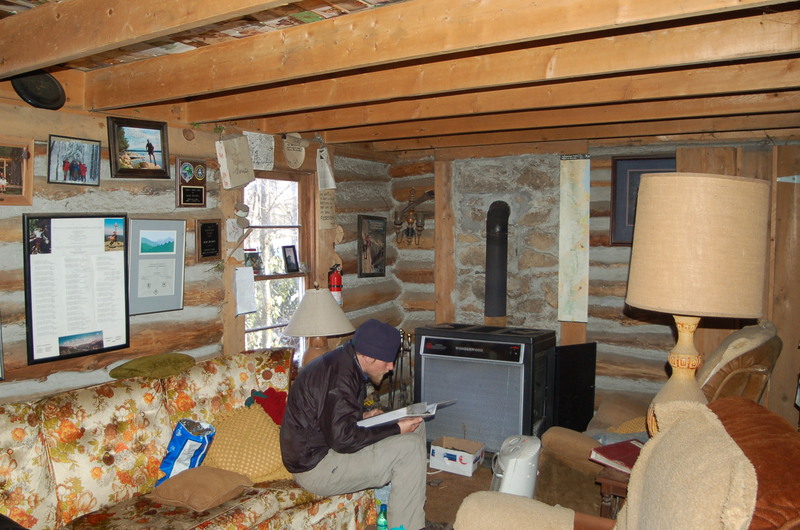 Since he started taking in hikers over a decade ago, 13,000 hikers had stayed at his place. He is a very inspirational man. The walls and ceiling of the hostel were covered in pictures from hikers that finished the trail. Once we send him our picture, we will be the first of 2007 to go up. 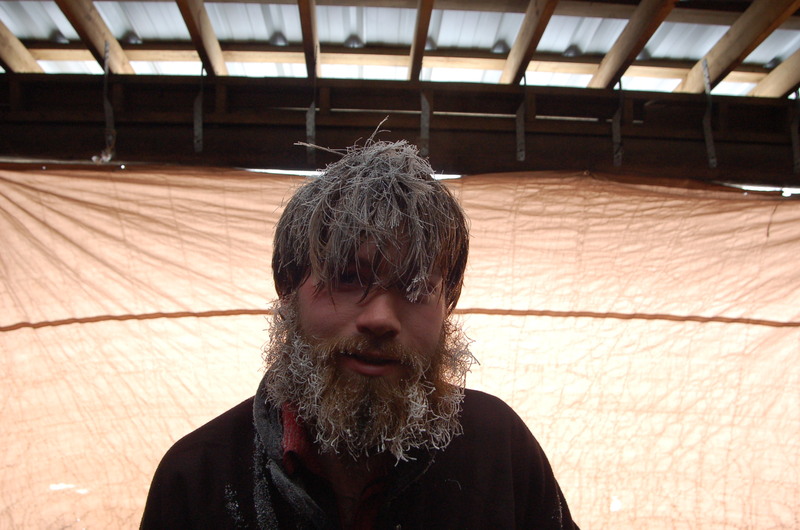 In the morning, he ran us into town to resupply and pick up our package from the post office. “Sky Watcher” met us at the hostel to join us for a few more days. Luckily, his brother was able to drop him off on his way to the coast. He was excited to break in his new boots. 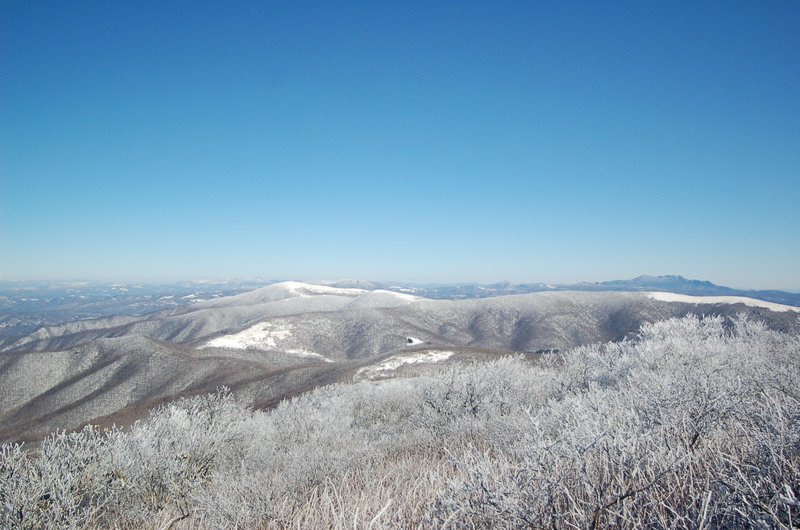 The climb out of Kincora gave us our first glimpse of Roan Mtn and the surrounding highlands. Sky Watcher’s 2nd day was a long 18 miler over some nice terrain. 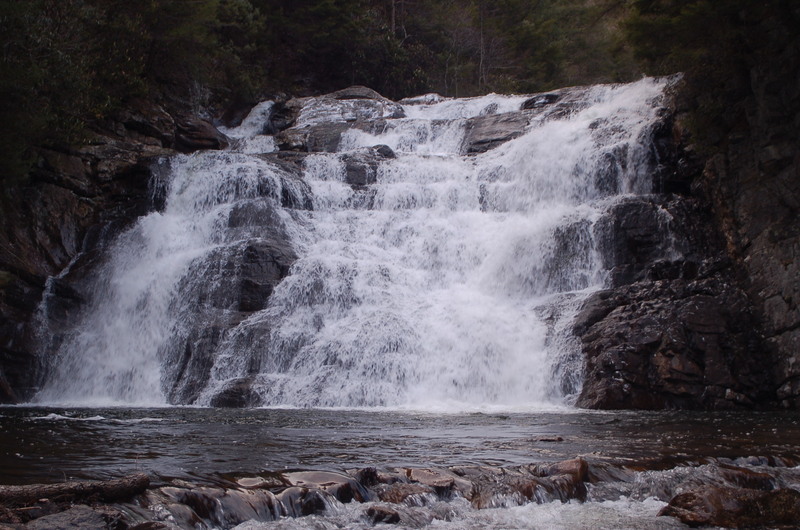 We also passed by the highest falls on the AT, Jones Falls. There wasn’t much water gushing over the falls, but there was a lot of ice built up all over it. We thought the following day would be simple, only doing 8 miles, but we were wrong. 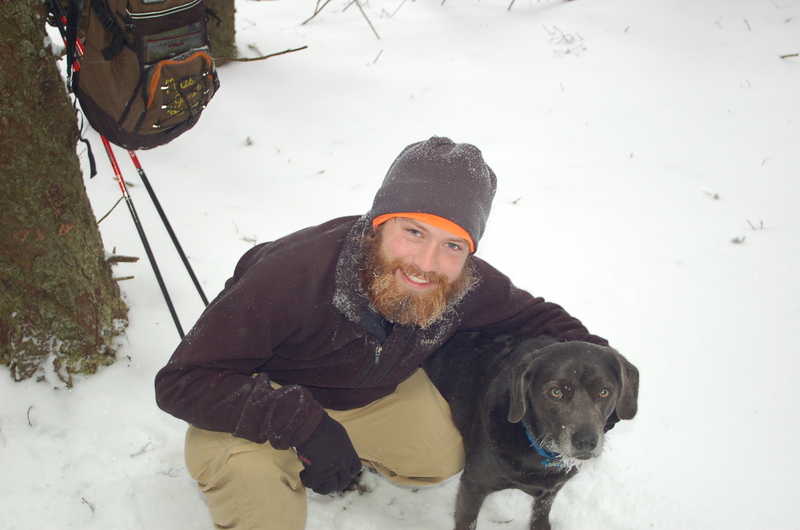 The deep snow slowed us down and the -10 degree wind chill over the balds cut right through us. To top it off, the shelter was a nightmare. It is an old barn that was given to the trail to use as a shelter, it sleeps like 40 people, the views are great, and its well ventilated. Basically, it is perfect for summertime, not during a wind and snowstorm. The snow blew in from every direction and every crack. We tried hanging both of our tarps to block the snow, but it didn’t help. We ended up wrapping ourselves in the sleeping bags with the tarp, but the snow still managed to pile on our faces. Needless to say, we didn’t sleep to well. The thermometer read zero degrees when we crawled out of bed. It was hard to get moving. We climbed up to the Roan Mtn highlands and were greeted with spectacular 360 degree views. 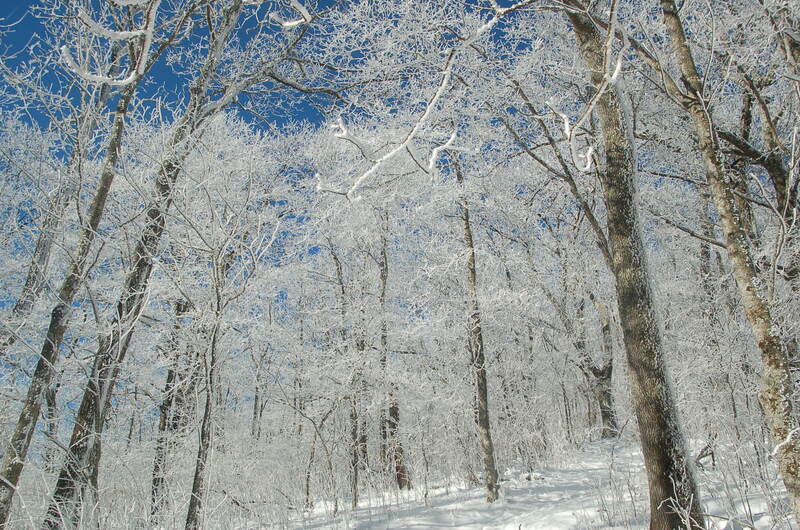 We haven’t seen such breathtaking views since the White Mtns. When we crossed over Carvers Gap, we met up with Ice Man’s cousin Karma and the wonderful Miss Janet who was nice enough to shuttle her up to the trail. Since our sleeping bags got wet the night before, Miss Janet threw them in her car and cranked up the heat to dry them out. We are so lucky. After a nice lunch break, we finished the climb up to Roan Mtn Shelter, the highest shelter on the AT over 6000ft. The trail was like an endless white alley all the way to the top. We were fortunate to have a fully enclosed shelter with no wind finding its way in. It still got really cold inside and Karma had a rough night’s sleep. She woke up with a bad headache and a sore neck, so instead of pushing out big miles, it was smarter just to climb back down to Carver’s Gap and head into Erwin to rest up. We continued on in the deep snow, half-skiing down the mountains. We met Karma at the next road crossing and she took us back to Miss Janet’s hostel in Erwin. While we cleaned up, Karma spoiled us by cooking an excellent dinner. In the morning, we had a great big breakfast and bid farewell to Sky Watcher once again. Since we had Karma’s car, a day off, and a need for warm weather, we drove down to Savannah, GA to visit a friend from back home. We were lucky to see both the moonrise and sunrise over the ocean. It was an amazing feeling to be at sea level just hours after being at 5000 ft covered in snow. We didn’t stay long, but we wish we could have. When we made it back to Tennessee, three of my brothers came down to visit. We got to enjoy the company while playing cards, eating pizza, and sitting down to watch a movie before bed. The following morning Karma bid us good luck and headed home. The rest of us boys drove up to Carver’s Gap and hiked up onto Roan Mtn Highlands where we had been just a few days before. The views were just as immaculate as they were when we first crossed over the highlands. I was glad we were able to take my brothers up to see the things that keep us moving. That night Ice Man and my brother cooked a huge Mexican style feast. It was awesome. When they headed home in the morning, we picked up from where we left off. We brought Miss Janet’s dog, Fabian, with us on our hike since she was going to meet us at another road in 19 miles. He was fun to hike with. Supposedly he has over 5000 miles under his collar. Today Miss Janet dropped us off at another point and we hiked 25 miles back to town again. We came across a couple more balds with views on all sides as well as some great overlooks near the Nolichucky River. It was a real workout to hike through the deep snow, but once we dropped in elevation it cleared up quite a bit. After 9 hours of straight hiking, we were ready for a foot long sandwich, a shower, and a good night’s sleep. Tomorrow we will be at the hostel working off our stay for the past few days. We were lucky enough that Miss Janet opened her doors to use since she isn’t open for another 10 days. Today the memories and impressions left from this section of trail are as loud as ever and present in everyday life. Through our second hike with Sky Watcher we got to know him a little better and would go on to have amazing Alaskan adventures with him years later. We instilled a sense of adventure in Joe’s brother Vince who came to visit and now has over 700 AT miles under his belt. Miss Janet has become one of the most infamous of Trail Angels and helped us not just with hiking the trail but also with supporting our lives away from the trail. It was Miss Janet’s hospitality that really provided the space needed for a bigger relationship to spark. I won’t get into a sappy love story on you, but Karma (my cousin) and TW hit it off pretty well. Soon after the trail they found themselves married and years later from then we all three found ourselves opening RRT. I can tell you that I didn’t and couldn’t of ever seen all of this coming. That is the magic of the trail to spawn long lasting and meaningful relationships and life lessons. The trail itself was beautiful in this entire section from Damascus to Kincora. The balds that we passed and ridge walking leaves plenty of room for views along the way. The weather turned on us a little bit but that’s what we signed up for. I will give you a fair warning, the barn shelter is not good for winter hikes and snow storms. Joe and I had wrapped our tarp around our bags trying to keep them “dry” but it wasn’t going to work. To date it may be the worst sleep I got on trail as I shivered the majority of the night. There are plenty of road intersections here and this area would be perfect if you are looking for a 3+ day trip on the AT. The morning after the barn was the day we were meeting Emily (Karma) at the road. I hustled and covered 3 miles in sometimes deep snow in little more than an hour. I was part excited, part cold, and in part just didn’t want to leave her alone roadside wondering where the heck she was. The whole time with family members and the side trip to Savannah really didn’t set us off pace and all happened fast. However, it was really rejuvenating especially for Joe who couldn’t think of much else.